Here is the brutal truth about time trial training. IT SOUNDS fairly straightforward. You, your bike and the clock, riding in splendid isolation as quickly as you can, away from the rough and tumble of the peloton. In theory a time trial should be a simple test of your ability to ride your bike as fast as possible over a set distance. In many ways a time trial is the ultimate challenge for a rider. There is nowhere to hide, no bunching pack to drag you along. And it hurts: in fact the pain will usually last from start to finish. But whether you achieve a personal best (or a personal worst) you will always be left with the same feeling when you cross the line: you will want to go faster next time. Time trials have that glorious habit of leaving riders hungry for more. If you’re serious about getting faster, beating your quickest time over a particular course and completing the perfect time trial, getting every little detail right is absolutely crucial, especially with regards to pacing, aerodynamics, preparation and technique. Pacing is everything when it comes to time trials. Getting the initial speed correct is the key to achieving your goal time. But the easy trap to fall into – and so many riders do this – is to go out too hard so your pace slowly but surely slackens off during the course of the ride. The end result? You finish meekly when you should be aiming to finish with a flourish. Starting at breakneck speed will NOT lead to a better overall time. If you blast out at full pelt you risk blowing up well before the end of the trial, which will lead to you running out of energy and finishing poorly. So with this in mind, the first five minutes of a time trial are crucial and will almost certainly dictate if you succeed or fail in achieving your goal time. In addition, your cardiovascular system takes a few minutes to react before it delivers optimally for your desired intensity. Even if you’ve performed a solid warm-up, you will be at risk of going anaerobic if you try to maintain your target pace right from the beginning of the time trial. While I strongly recommend the use of power meters to help with your pacing strategy, it is possible to learn how to pace yourself sensibly without using one. The traditional view among the majority of coaches and riders is that a time trial should be tackled by adopting a strong but even pace throughout the whole race. But I beg to differ slightly. I strongly believe that a few judicious and subtle changes to your pacing strategy will yield a faster overall time. I stress again… it is so vital not to start too fast. Try staying SLIGHTLY BELOW your planned target power for the first five minutes of the time trial. Then after five minutes make sure you ride as close as possible to your target power. Now here’s one difference to the ”ride-at-an-even-pace throughout” mantra: Try pushing a tiny bit harder uphill, and then ease off slightly on the descents. Do this and you will achieve an overall quicker time. About 20 watts more power riding uphill will save you more time than you will lose by reducing 20 watts going downhill. This is because there is a stronger aerodynamic drag at higher velocities. When it comes to pacing, one great training tactic is to practise completing the distance you will be tackling at a flat-out pace. If you find that your speed slackens off towards the end, then you have clearly gone out too hard. However if you feel fresh at the end then you probably haven’t paced it fast enough. Practice makes perfect, so it’s worth practising until you know for certain what a challenging but sustainable effort over a given distance feels like. Analyse your last time trial (heart rate, power outputs). Develop a new pacing strategy for your next time trial. Perform specific time trial training with your new pacing strategy. *Obviously if you are taking part in a track pursuit then you will have to use a different pacing strategy. Yes, aerodynamics play a big role, but they are not the deal breaker when it comes to achieving a goal time. However some facts are indisputable: one big fact is that 90% of a rider’s power output is used to break wind resistance. In fact wind resistance is the biggest enemy when competing in a time trial. So to counter the elements finding the optimal body position is crucial as it minimises the aerodynamic drag, so requiring fewer watts to ride quickly. The position of the body is also where riders can make the biggest improvement to overall aerodynamics. And if your bank balance won’t stretch to purchasing a dedicated time trial bike ‒ and all the expensive accessories built for brilliant aerodynamics ‒ then nurturing a good body position is even more important. There is even a growing view among some experts that the most aerodynamic position for a rider can actually lead to a decrease in pedalling efficiency, and a rise in the metabolic rate of effort. Subsequently, this can lead to a cut in the average power output of the cyclist.This reduction in power can be between 10-20%, say some experts. The body position can also become so extreme that it actually limits your performance even though it is more aerodynamic. However I believe that with targeted uphill training while maintaining the aerodynamic position it is possible to cut down on this loss of power caused by aerodynamic body position. Wind-gallery tests are also extremely useful but are expensive. However there is one simple test to gauge the aerodynamic advantage of different bike positions. All that’s required is a 300m descent, with a gradient to allow a 50 km/h speed without effort on the pedals, followed by an ascent to slow down and stop the cyclist within a fairly short time: the further the cyclist goes up the hill, the more aerodynamically efficient the body position. This can take a few attempts to eradicate statistical errors, and conditions such as wind speed/air temperature have to be taken into account but, in the end, you will find the results are reliable. In terms of body position the frontal area is the most vital aspect. The last point above is a good one. An aero helmet (app. $150) is a good place to start if you have some spare cash to splurge. There is no doubt that an aero helmet will make you significantly faster so it’s a solid investment. Experts estimate that an aero helmet alone saves a rider 10-15 watts of power at time trial speeds. You could also try lowering the front of the bike, which could be as simple as flipping the stem, and fitting some tri-bars, which cost as little as $50. After an aero helmet, you could start thinking about adding aero drinks bottles, overshoes, skin suits, deep-section wheels. But it is wise to spend any money you have on making sure you get into a good body position first. And while all this expensive equipment is useful, pricey kit won’t make you go faster if your body acts like a huge air brake. So if your budget is limited, keep in mind that body position should be your main priority. Focus on improving your body position on your current bike and invest time and energy on the areas where you can make the biggest gains. Remember: cut wind resistance and you’ll go faster. Perform aerodynamic tests with your current bike. Reduce your frontal area. Make a “longer” position on your bike. Perform an aerodynamic test with optimised set-up. Repeat above steps until you see gradual improvements. In cycling your training should always be targeted to your goal. So for time trials you will have to train at a very high intensity if you want to improve your time over a given distance. To sustain a strong pace for the duration of a time trial, your training sessions need to be explosive. So interval training is the key, with a combination of sub-threshold, threshold power and VO2 max intervals. Professional riders target their time trial training towards improving their threshold power. But developing a large aerobic engine will not happen overnight. It demands a huge amount of training and effort, and the adoption of the highest quality training principles over several years. But one thing is certain: time trial riders (just like sprinters and climbers) do need a fantastic threshold power as a strong performance at threshold power is obligatory for winning any race. And another thing is certain: training with a very high intensity will boost your ability to continue riding without accumulating lactate. VO2 max intervals are a brilliant stimulus for your aerobic system. They also provide a great boost to your threshold power. VO2 max may not be the most crucial power output but the advantages of learning this skill are immense because the physiological adaptations to VO2 max training are the same as the ones you achieve when training at lower intensities. Also bear in mind that threshold power is only a percentage of your VO2 max. The physiological skills you train with during threshold power intervals are also stimulated at VO2 max intensity. These are the most popular way to boost threshold power. The key is to know your power output or heart rate at threshold power and then use these to pace yourself throughout intervals at the same intensity. The best tactic is to tackle a time trial as a yardstick or reference. The toughest part of these intervals is to stay at the right intensity throughout. Setting off a tiny bit too fast will make it impossible to maintain the right intensity. Starting too slowly, and you won’t benefit from the adaptations you are training for. Threshold power intervals are extremely tough but really effective in creating a better aerobic capacity and they are brilliant for any rider want to become a better time trial rider. High intensity interval training is only beneficial if you complete them. So while VO2 max and threshold power intervals are the most effective ways of training for a time trial, they will be rendered ineffective and meaningless if you don’t complete the actual intervals at the required speed/intensity. So physically and mentally you will undoubtedly achieve a better training result for a time trial if you opt for an intensity with a higher success rate. This is where sub-threshold power intervals come into their own as they can offer major improvements. Some experts also argue that there is a physiological sweet spot as you can train at a high oxygen consumption without going anaerobic, with a positive knock-on effect on your aerobic system. So for time-trialling, they are excellent for training. I would strongly recommend that you track your training progress using a series of physical performance tests. For example if you train for a 25km time trial then measure your average power output for such a distance in training. But do remember that the beauty of hard interval sessions is that as you begin to increase the size of your aerobic capacity, you will also boost your power output for that distance. This will allow you to monitor your physical performance and, more importantly, separate these improvements from other improvements caused by improved aerodynamics. One thing is for sure: the magic formula is out there waiting for you. Threshold power intervals e.g. 3x12min. VO2 Max intervals e.g. 3x(3+3min). Many cyclists with a race or time trial on the horizon see it as a perfect excuse to gorge on a mountain of food. But while carb-loading is recommended to a degree, moderation is advised when it comes to time trials. For an event like a 10 or 25-mile time trial, a meal rich in carbs, such as pasta or rice, the night before the race is probably sufficient. There is no reason to eat food high in fat. On race morning focus on carbs again. Jam on toast is a good choice while if you prefer cereal ensure it’s low in fat and fibres. En route to the time trial, it is worth sipping an energy drink while a dose of caffeine (up to 200mg) may also be advisable. Stay euhydrated during warm up. For a short time trial of 10 or 25 miles don’t bother with a drinking bottle as time lost sipping the fluid will outweigh the benefits of taking on mid-race fluid. After the event make sure you have a recovery drink ready. Failing to warm up properly will mean you won’t benefit from all those tough hours of training. One warm-up strategy is to ride comfortably for 10-15 minutes and then perform three 10-15 second bursts (not all-out sprints) with a couple of minutes of recovery in between. Slightly increase the intensity so you raise your oxygen consumption in small steps. This protects you from going anaerobic. Aim to warm up for at least 20 minutes and there is rarely no reason to spend longer than 45 minutes. If you’re in a hurry, check out this quick warm up. While psyching yourself up may seem the obvious thing to do, staying calm is probably more important. Get too worked up and you may be tempted to go off too hard. Stay calm and stay in control of your effort. Remember if you go off too fast, there is no chance to recover. Familiarise yourself with the course if possible. This really helps and makes sure there are no nasty surprises on the day. It is better to know where any killer hills (or potholes) are lying in wait. And even on well-marshalled courses, cyclists can still take a wrong turn in the heat of battle. So do you feel motivated? Are you now ready to complete the perfect time trial? Click here and receive additional training tips from Jesper. Hi Michael. I love comments and I appreciate that you take that extra time to share your thoughts. You’re right that specificity is important. That’s a cornerstone in optimized cycling training. Even though it might already be included in my advice: “Perform a training ride with your new pacing strategy.” it is still worth to remind the importance of specificity. The primary ability appears to be Muscular Endurance coupled with speed endurance. How often do you see the need to train on your time trial bike? I’ve often found as an asthmatic I need a bottle for my throat on time trials over 10 miles long just to keep my throat from drying. your articles ar so good; just the right information !! Thanks, you can find Training4cyclists on Facebook here. I like this article as all others on this website. I would try to follow your tip – 20 watts pluss going uphild instead the oposite way. I also will focus on body postition on my next trainingsession. If you really need liquid or sportsdrink during a TT, try a camelback benith your shirt instead of a bottle. This could also improve your aerodynamic because of the buckle on your back. maybe you can write an article about philippe gilbert? why you think he’s so good? 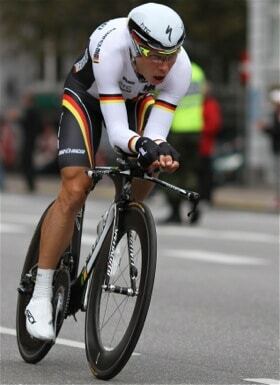 he trains on his feeling and never with powertap,srm or even hartratemonitor…. specificity? He is a true (RR) champion. He knows how to do things. But what about his TT. I can’t actually remember anything. An article about feeling could surely be interesting, but if it is not measurable, so what do we get out of it – if we fx. want to adapt his methods ? However, I believe that the man is “tested”, and that he knows what he does (periodization, proper amount of intervals, etc.). SRM, Powertap, etc. are just helping tools to reach full potential in less time… and for some it is very fun too…. the riders of the Lotto team are/were supported by the Energy Lab center; I know he didn’t want to get training schemes, heart rate zones, or even training with powertap (Lotto had powertap last year, now it’s SRM). But alle riders had to do a maximal lactate test. I also read, when he wasn’t a pro yet, he also did training rides of 8hours!! his trainingmate told: “today trained more than 8hours with philippe; never the speed was under 35km/hour!! Jesper, As always great information for anyone who rides a bike and wants to improve. I followed your program last winter and came out of the gates the fastest I’ve ever been. My only complaint is I ‘peaked’ too early and faded in the middle of the race season. (I am a lowly cat 5 racer in Canada). By the end of June, my legs were in a constant state of aching and I ended up taking two full weeks off the bike to recover. It would be a stretch to say I ‘overtrain’ as I only train 3 days a week (plus riding to work). Maybe it was too much intensity for a 48 year old weekend warrior. Have you any suggestions on how to avoid that next year? I’ll be following your program again this winter! Once an athlete has performed at the end of your program how it should work? I suppose it’s 16 week program we’re talking about. If your base is okay, so you will not peak too early. A strong and sound base is maybe 7-9 hours of exercise a week for several months. It is very individual, but after you have completed the program, then you can have a period of 3-6 weeks where you “just” maintain shape, for example by cutting down on volume. After this, you can build up again, but remember that it is a long and continuous process. Do not be a slave to numbers and intensities, but a power meter will help you a lot. Thanks Jesper! Fantastic demystification of a discipline in which I have struggled badly over the years. But what with training ITT for triathlon? Do You recommend the same training plans for triathlete which ride 90 or 180 km and after that run? I think that triathlete needs more aerobic trainings. Do You agree? @tomk – Not sure which training program you are talking about? One of the most common arguments against interval training during the winter is the risk of peaking too early. I disagree. If you are not competing at a professional level, your risk of peaking too early is extremely low. Remember that your current fitness leaves significant room for improvement and that’s why it makes sense to train longer, faster and more frequently. You are far from peaking. Here is an example. Let’s say you formerly trained three times per week from November to February. That’s generally what people do in your local cycling club. But this year you want to take your performance to another level, so you decide to jump from, for example, three to six weekly training sessions. After 14 days of training, you will begin to reap the initial rewards of your hard work. You will begin to ride slightly faster than cyclists at your normal level. It’s a great feeling. Your local cycling club will notice how much progress you make. first critical questions about your training methods will arrive. It is inevitable that a few experienced riders will warn you that there is a great risk that you will peak too early. And if you realize a few weeks later that you’ve been a little too optimistic about your training progress, people will tell you that you’ve peaked too early (because you didn’t listen). The real case is that you did not peak too early. You had a short period of overshooting ‒ and that’s it. Overshooting has nothing to do with peaking, which is a completely different story. It simply doesn’t make sense. How can one peak without being even close to one’s own physiological potential? And, even more importantly, how should one be able to really peak without even tapering? And doing so while increasing your overall training amount? So if you raised your workload a bit more gradually, you would be able to train 4-5 times per week now and that would, in the long run, make you significantly stronger than the three times per week group you used to compare yourself with. It’s important to notice that high intensity intervals are not just high intensity intervals. Since road cycling is mainly an aerobic activity, it is also clear that most of your training should target the aerobic engine. It takes more time to build a solid aerobic engine, but once it is built it will remain at a reasonable level with the minimum of training. But if you want to reach your full aerobic potential, you will have to train for several years. If you train strictly for anaerobic power, you will improve this skill really quickly, but it will not make you a successful road cyclist in the long run (unless you train for special events like 1K on the track or BMX etc). Thank you so much for this informative article. Completed my first 10 yesterday and guess what, looking at the post ride stats I went off too hard, your information is compelling. Will work on the workouts and maintaining / improving my position on the bike and go for it again next month. There’s just so much nice kit though………..
My question is ever since age of 15 is when my love for cycling began and it’s been my only drug I ever needed, I’m now 50 (old). About 11 years ago I was hit by a car while training in Santa Barbra calif, where I spent 94 days in the hospital due to having my liver ruptured, and numerous surgeries since 16. At age 39, I was riding about 250-300 mi/week, and my longest ride was 242mi in over 14.5 hours, with about 8,000 ft of climbing. But since then due to medical reasons have no rode at all, but I’m hopeful now my medical problems may have been resolved from I pray will be the last surgery I have 8/2/2012. But now at age 50 I’m having a great deal of doubt if I could ever even come close to the cyclist I once was ? It’s not that I don’t know how to train, it’s how do I even begin on being somewhat a competive rider again since ever since at a young age I really never got very far out of shape, as you said once you become somewhat conditioned it’s fairly easy to maintain, in fact as you spoke about over training and peaking sooner that desired, it was always very hard to rest even when my body was screaming for it I always found that to be hard to do, even when my resting HR was telling me so. After all I gone through it seems that I have so much doubt, and now have become very weak, legs much smaller. I guess what I’m asking for is how to get stated from scratch, how to build my legs, back,neck, hands, well you now and motivation, and could I ever come close to the athlete I was 10 years ago, and if so how much time am I looking at from starting from on big ZERO, any pointers I would be so grateful and hope to once again be a fair cyclist. As you might see on my pictures on Facebook I prefer TT . What I’d like to know is. and the other “Time Effective Cycling Training”. 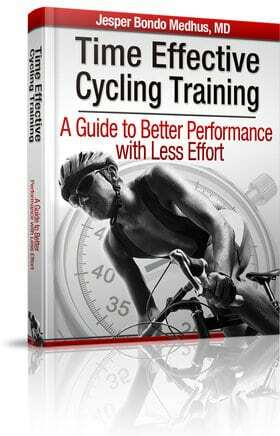 What ‘s the best book for getting better in time trial courses ? Which set of weights do you prescribe for training? Deadlift / single leg weight / Squats back and front ? Would you do this on a 80-90% RM and short repetitions ie 3 sets 4-5reps? I can hold 242 watts for 40 km (69-70kilos thus 3.5 watts x kilo). I wish to increase it to 255-260 W. I am a triathlete. cheers from AUS. 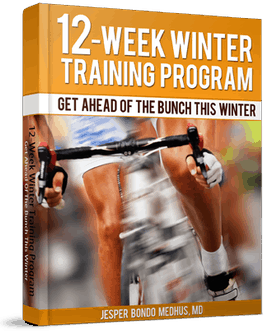 hi Jesper, does your 12 week training ebook cover tt training for the winter. What advise can you provide for those of us that are training/ coaching an athlete(s) that continue to over-train? How do we as coaches get through to athletes that they need to get rest? I find your approach to training very refreshing. Please keep up the good work! I was wondering if you would consider being a guest on my podcast, cyclingtimetrialpodcast.libsyn.com. I would like to do a show on winter training. It would be an opportunity to promote your winter training plan. I typically furnish guests with an outline so you have an idea beforehand and just have a conversation for 30-40 minutes over Skype. Thanks for your consideration. I love your article, Jesper. I am new to time trialing, although I have been cycling for many years. I have always been able to sustain a pretty high effort on hills (at or near threshold for more than 30 min), but I have never been able to push big gears on the flats and cannot spin in a big gear for more than a couple of minutes or so. What can you recommend? I love riding and want to try to time trialing. Great reading. Always learning. I live in Tucson, Arizona. My racing age is 72. I don’t train riding many miles. I mainly ride quality miles. At 178 pounds of muscle, I train my weaknesses, which is up Mt. Lemmon weekly or more. HIT works! I’m able to ride a 30 minute 20k TT. I continue to tinker with power (W) and body positions. In all, thank you for all the information provided.